The purpose of Ainmean-Àite na h-Alba is to determine authoritative forms of Gaelic place-names across Scotland with reference to both research into historical forms and consolidation of current usage, to apply consistent orthography of Gaelic in place-names, and to encourage the adoption of these forms of Gaelic place-names. Stòr-dàta fiosrachaidh air ainmean-àite ann an Alba bhon leabhar le Iain Mac an Tàilleir. Mu 2000 ainm, Beurla-Gàidhlig agus mìneachadh. Iain Mac an Tàilleir, 2003. Scottish placenames database from Iain Mac an Tàilleir's book. Around 2000 names, English-Gaelic and explanations. Iain Mac an Tàilleir, 2003. Mapa Gàidhlig de dh'Alba le ainmean-àite, cumadh tìre agus grunnd na mara, dòighean siubhail agus ùghdarrasan ionadail. Sgèile 1 : 850,000. Stòrlann, 2007. Mu 3000 ainmean-àite. Meud: 1189 x 841 mm, no 46.8 x 33.1 òirleach. Sgèile: 1:660,000. Còig meanbh-mhapa air Glaschu, Dùn Èideann, Dun Deagh, Obar Dheathain is Sgìre na h-Eaglaise Bige/Shruighlea le sgèile 1:140,000. Le Pòl Caomhánach, Newsnet Scotland, 2012. Around 3000 placenames. Size: 1189 x 841 mm, or 46.8 x 33.1 inches. Scale: 1:660,000. Five insert maps of Glasgow, Edinburgh, Dundee, Aberdeen, and the Falkirk-Stirling area, scale 1:140,000. By Paul Kavanagh, Newsnet Scotland, 2012. Rannsaich ann an seann mhapaichean. Sgeama nan rathaidean-iarrainn trì-chànanach, sa Ghàidhlig, Beurla agus Beurla Ghallta air a dhèanamh le Pòl Caomhánach. Newsnet Scotland, 2011. 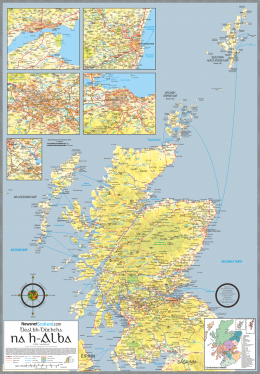 Trilingual railway map in Gaelic, English and Scots created by Paul Kavanagh. Newsnet Scotland, 2011. Tha am mapa "Tìr Cholmcille" ag atharrachadh mar a tha daoine a' faicinn an dàimh eadar Alba agus Èirinn. Tha e a' sealltainn Èirinn agus Alba a' coimhead air a chèile Tha e air a chlò-bhualadh le Harper Collins, agus tha ìomhaigh an dà dhùthaich cho ceart ri clàr sam bith eile. Tha na ainmean-àite ann an Gàidhlig agus Gaeilge. Colmcille, 2012. The map Tír Cholmcille changes the way people look at the the relationship between Scotland and Ireland. It shows Ireland and Scotland oriented towards each other, it is printed by Harper Collins, and is as exact a representation of the two countries as any other. The placenames are in Scottish and Irish Gaelic. Iomairt Chaluim Chille, 2012.